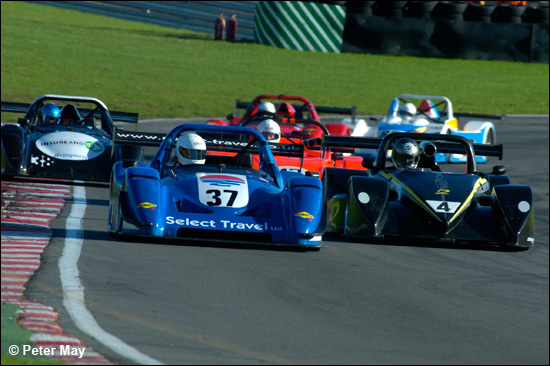 Race one saw seven cars making up the Britsports grid at the final round of the year at Brands Hatch, delivering a slight improvement over the previous round held at Donington Park. However, the racing made up for the lack of numbers. A damp but drying circuit made tyre choice particularly difficult in qualifying. As Ian Ford, running a Radical SR8, put it: “Do I destroy a set of wets or do my best on a set of slicks?” Howard Spooner, who was the anticipated pole man, damaged the rear left of the three litre class one Jade Trackstar in an incident at Paddock on slicks and consequently only managed to qualify fifth on the grid, while Ford, also on slicks, had a harmless spin exiting clearways. 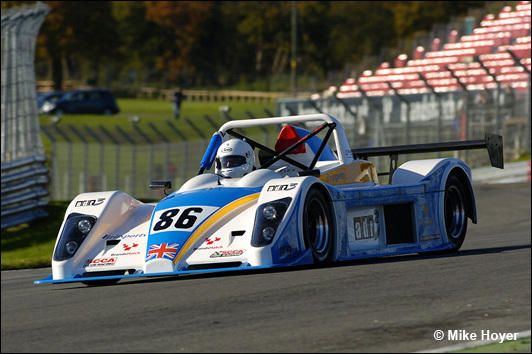 However, Duncan Williams in the 1500cc Radical Prosport, running in class three, was quickest, putting the car on pole position with a time of 49.454 seconds, followed closely by the Radical SR3 of Barry Gates and Anthony Dunn. 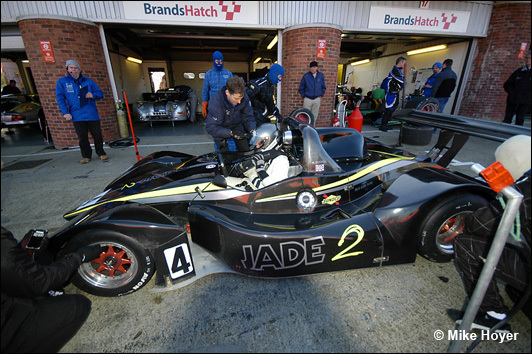 Ford was third quickest, with William Curtis in a class one Jade fourth. 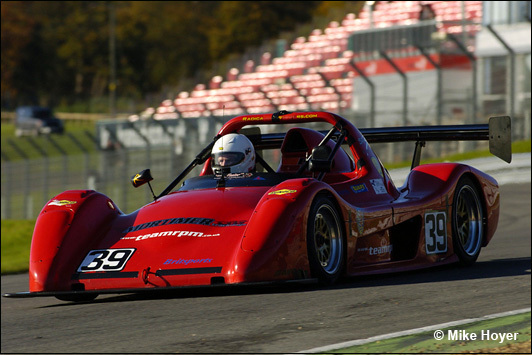 Spooner was fifth with Jean-Louis Rihon’s Radical SR3, shared with Nigel Greensall, sixth. The Michael Richardson / Phil Bennetts ADR Sport qualified seventh, completing the grid. The first race of the day for the Britsports was scheduled for fifty minutes and saw Duncan Williams (below) pull away as soon as the lights went green. He immediately started punching in quick laps and putting a gap between himself and Howard Spooner, who had a dream start jumping from fifth to second during the course of lap one. Williams and Spooner immediately pulled away from the rest of the field, leaving Ian Ford (#37, below - about to be passed by Spooner) to lead the rest of the pack in third place, whilst William Curtis and Nigel Greensall were having a good scrap for fourth. Meanwhile at the front, Spooner was fast catching Williams and on lap nine passed him for the lead, but not without having to work for it, after great defensive driving by Williams in the less powerful class three car. Barry Gates, who shared the front row with Williams, was struggling to find pace and had consequently slipped to sixth overall. Lap 15 saw the ADR Sport of Michael Richardson come into the pits with over-heating problems, which proved terminal. Meanwhile, William Curtis in the Juno passed Ford for third place and set about catching second place man Duncan Williams, and on lap 29 managed to get past, again not without having to work hard for it. 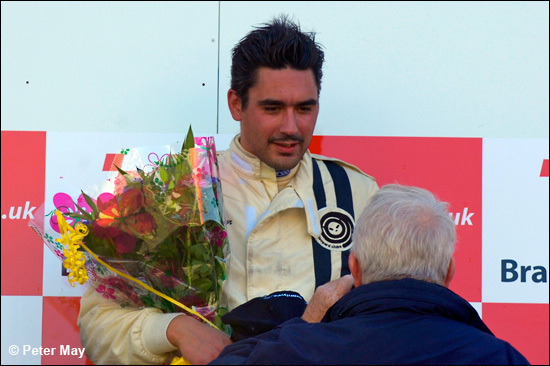 The same lap also saw Nigel Greensall hand the class three Radical over to second driver Jean-Louis Rihon in a strong fifth place. At the front Howard Spooner was now a healthy sixteen seconds ahead of Curtis who brought the car in on lap 36, followed a lap later by leader Spooner. 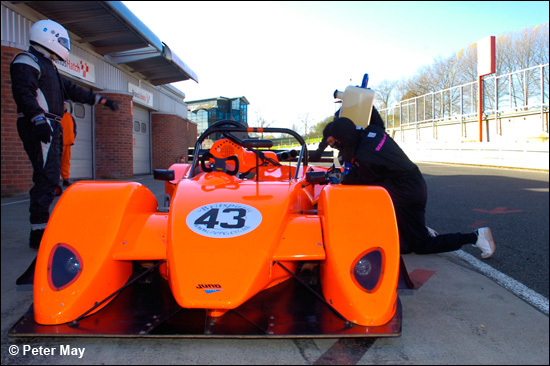 Both cars refuelled and waited for the regulation ninety seconds before returning to the circuit behind new leader Ian Ford, who pitted two laps later and, like Spooner and Curtis (below), had to wait for the full ninety seconds. All of this had given Duncan Williams, who had pitted on lap 31, the lead of the race in the tiny 1500cc Radical Prosport. 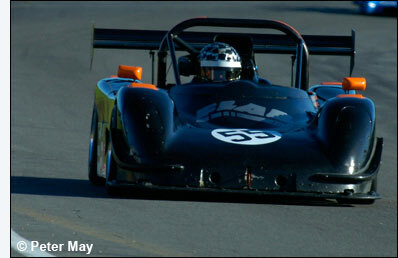 The car had a much smaller time restriction in the pits of only 30 seconds, a full minute less than the bigger cars. This was set to make the final fifteen minutes of the race a real cracker. Spooner was punching in lap after lap of quick times in an effort to catch Williams for the lead, and after a near collision at Clearways on lap 52, managed to pass the Radical to pull away for a comfortable victory. Meanwhile, Ford passed Jean-Louis Rihon for fourth with only two minutes of the race remaining. However, the drive of race one had to go to Duncan Williams who was on the absolute limit for the entire race, making what could have been a procession of seven cars circulating into a real crowd pleaser. 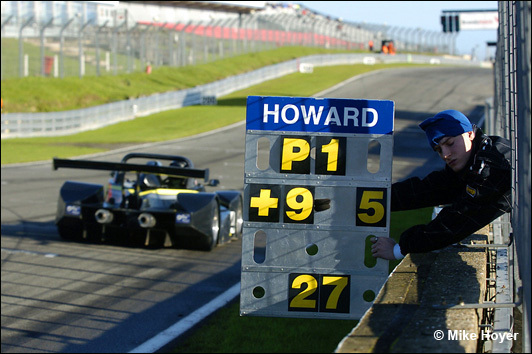 Race two saw five cars come to the grid, with pole man Howard Spooner electing not to race. In fact, race two was better than race one, with Williams and Curtis passing each other two or three times a lap for the first twenty minutes. 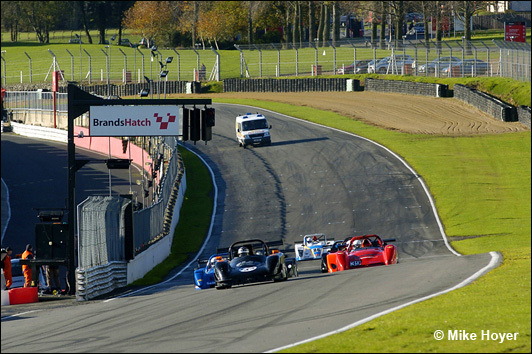 It had everyone at Brands Hatch on their feet. The tiny Prosport in the hands of Williams was a joy to watch, having to brake later and carry every ounce of speed through the corners to keep up or ahead of Curtis’s more powerful Juno. By lap four there had already been five changes for the lead and this scrapping allowed Ian Ford to start catching the leading pair, with Nigel Greensall in the SR3 somehow managing to cling on to the back of Ford’s class one SR8. Lap 13 showed Williams thinking and foresight, when both leaders came round to lap Barry Gates at the end of the main straight. Williams cleverly used the backmarker to stop Curtis from finding a way down the inside. This was exactly the sort of craft that kept him ahead of Curtis and, when behind him, in a position to again challenge for the lead. Unfortunately on lap 18, Ian Ford came into the pits with gear selection problems, effectively ending his afternoon, even though he came back out, but eight laps behind the leaders. This in turn handed third place over to Nigel Greensall. Lap 32 saw Greensall and Gates (above) come into the pits for their stops. Both cars refuelled and changed drivers, with Rihon taking over from Greensall, and Anthony Dunn for Gates. Dunn immediately started catching Rihon and soon passed him for third. Back at the front, the race changed when Curtis pitted and found himself having to wait for the ninety second stop, effectively handing the win to Williams, who only had to wait for thirty seconds. Curtis did, however, end the race only ten seconds behind Williams, after a great drive to close the gap. 5 37 1 Ian FORD Radical SR8 50:53.921 56 7 LAPS 79.17 46.512. Williams is racing in Estoril next weekend and is sure to be a front runner. Credit should also be given to Barry Gates who finished third, in only his third race, with team-mate Anthony Dunn. 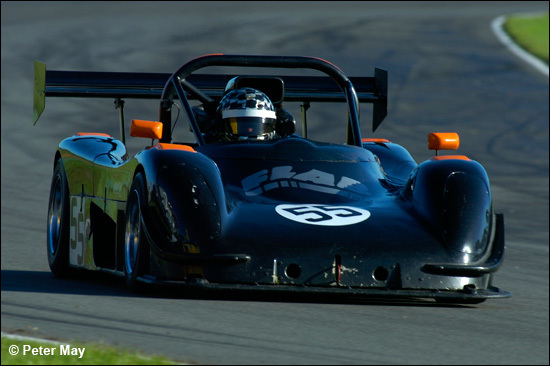 Ian Ford intends to spend much of the winter and early next year gaining experience by getting more time in the seat and bringing lap times down, with the intent of mounting more of a challenge in his SR8. With the season over, reflections on it should be positive. All those who have been racing in the Britsports championship have enjoyed themselves and with big changes expected for next year it is likely that the grid is regularly going to be full. If five sports cars can keep people entertained then a whole grid should be awesome. Watch this space…….